The potential for highly profitable foreign investment in Africa is enormous, but many investors remain unaware of the past record and current opportunities, argues the UN Conference on Trade and Development (UNCTAD). 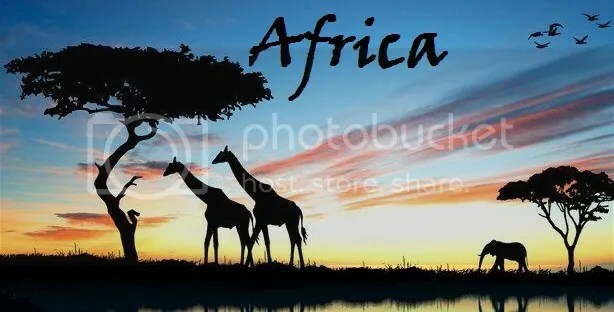 “Africa’s profitability is one of the best kept secrets in today’s world economy,” The Former UN Secretary-General Kofi Annan declared at the annual summit meeting of the Organization of African Unity. Specifically citing the UNCTAD report, he noted that Africa also has experienced impressive economic growth rates in recent years. The profitability of foreign companies in Africa has been consistently higher than in most other regions of the world. Africa is favorably positioned to become the 2nd fastest growing region in the world, and according to the International Monetary Fund (IMF), robust growth in sub-Saharan Africa is set to accelerate in 2014, reflecting improved prospects in most oil exporters, and in several low-income countries and fragile states. The IMF’s latest Regional Economic Outlook for Sub-Saharan Africa projects GDP growth to accelerate to 5½ percent in 2014 from about 5 percent in 2013. The faster growth is expected to be underpinned by large investments in infrastructure and mining, maturing investments in transport and telecommunications, and a rebound in agricultural output. Indonesia has become a favorite emerging country for international investors, as ongoing reforms in areas such as macroeconomic framework, banking supervision, accounting standards, transparency and governance issues by the government have enhanced the local investment climate. Moreover, the country possesses positive fundamental elements, including a huge population, growing middle class and young workforce, enormous domestic market, endowment of a wide variety and abundant natural resources like natural gas, coal, geothermal, palm oil, cocoa, tin, nickel and bauxite as well as a pool of diversified import export markets. Indonesia has regained the confidence of international investors after the Asian Financial Crisis in 1997‐1998. To get its economy back to a strong footing and increase its credibility, Indonesia has undertaken the following reforms: Making changes to the macroeconomic framework; Strengthening supervision of the banking industry and scrutiny of accounting standards, and Improving transparency, enhancing governance issues, and reducing corruption. Through a more flexible exchange rate regime and an inflation‐targeting framework, Indonesia has created a more stable macro economy. The better banking system helps stabilize and lower non‐performing loans together with increasing the profitability and efficiency of banks in general. Furthermore, more transparency on information and data reduces investors’ concerns over governance and other issues, leading to increased confidence and investments. The results of those reforms are evidenced from the positive growth in Indonesia during the global economic crisis in 2008‐2009. In 2009, Indonesia managed to grow its GDP by 4.6% when the advanced economies registered a negative growth roughly in the 3%‐5% range. Indonesia grew by 6.2% in 2012 and in 2014, stronger economic growth is expected around the lower end of the 5.8-6.2% range. Indonesia’s economy grew by 5.7% in 2013, making “The World’s Most Stable Economy in the Last Five Years” according to The Economist Magazine. 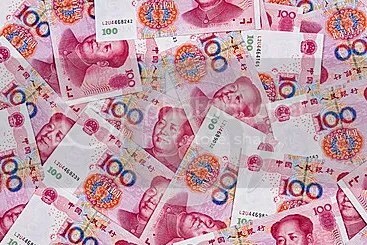 Future economic expansion is expected to include more inclusive growth as nominal per-capita GDP is expected to quadruple by 2020, according to a Standard Chartered report. Green nanotechnology is the development of clean technologies, “to minimize potential environmental and human health risks associated with the manufacture and use of nanotechnology products, and to encourage replacement of existing products with new nano-products that are more environmentally friendly throughout their lifecycle” As the growing needs to protect our environment are increasing, many scientists are looking into ways to develop clean, affordable, and renewable energy sources, with a smaller environmental footprint and minimise pollution. One major project that is being worked on is the development of nanotechnology in solar cells. Solar cells are more efficient as they get tinier and solar energy is a renewable resource. 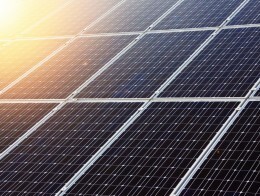 A group of researchers are making solar power significantly more efficient by scooping up more of that wasted energy. Researchers at Stanford University have found a way to trap light in organic solar cells. The idea is that the longer light is in the solar cell the more electrons will be generated. 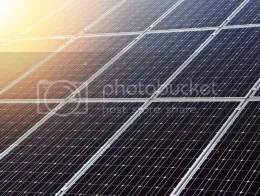 The researchers found that by making the organic layer much thinner than the wavelength of light and sandwiching the organic layer between a mirror layer and a rough layer the light stayed in the solar cell longer and excited more electrons. Researchers at Michigan Technological University have developed a honeycomb like structure of graphene in which the graphene sheets are held apart by lithium carbonate. They have used this “3D graphene” to replace the platinum in a dye sensitized solar cell and achieved 7.8 percent conversion of sunlight to electricity. Researchers at Los Alamos National Lab have demonstrated a solar cell that uses a copper indium selenide sulfide quantum dots. Unlike quantum dots containing lead or cadmium the copper based quantum dot is non-toxic as well as low cost. MIT researchers have made major strides toward developing solar cells that are inexpensive, efficient, flexible, and transparent using a design that combines two special components: nanowires and graphene. Tests with assembled solar cells showed that incorporating the nanowires pushed up device efficiency and that there was no performance penalty for replacing a conventional high-cost, brittle electrode with their version made of abundant, inexpensive carbon.